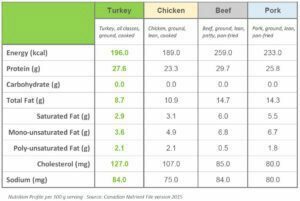 This nutrient information has been updated based on an extensive analysis conducted in conjunction with Health Canada and reflects the new turkey nutrient data available on Health Canada’s Canadian Nutrient File website. 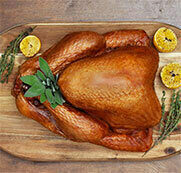 How Does Ground Turkey Stack Up? See our comparison chart. *NE (niacin equivalent) is the unit used to express niacin content of food. It represents preformed niacin plus tryptophan equivalents.